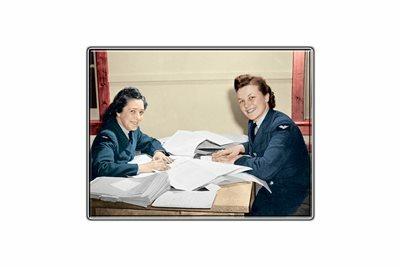 Two timekeeping personnel of the RCAF Women's Division, No. 2 Service Flying Training School, RCAF Station Uplands, Ottawa, Ontario. RCAF Station Uplands was established by the Royal Canadian Air Force in August of 1942 and operated until the 1990s. Thousands of Canadian pilots, destined for the war in Europe, learned to fly there. These ladies, whose picture was snapped just after the base opened, were two of the thousands of administrative and support personnel who kept the base running. Uplands was one of Canada's largest bases. If you've been to Ottawa's Macdonald-Cartier International Airport, you have an idea of how big the base was. Part of the property it was located on is now the airport.